It’s Holiday Email Marketing Time!Let’s Get This Party Started! It’s Holiday Email Marketing Time! There seems to be a lot of criticism these days about the proliferation of holidays, the earlier and earlier starting times of the holiday decorations, and the corporate takeover of our beloved traditions. But to this we say, “Who doesn’t love another party?” More holidays just means more reason to party, so if starting the celebration early is wrong, we don’t want to be right! Sure it seems a bit much that folks keep starting their Black Friday sales earlier every year but, personally, we can’t wait ‘til that not too distant future when we can get our Christmas shopping done in August! That’ll just give us more free time to deep fry our Thanksgiving turkey and start searching for a Christmas tree so big it’ll put the Rockefeller plaza to shame. The spirit of the holiday season has always been one of inclusion, warmth and the spreading of good cheer. So instead of nay-saying the addition of something like Cyber Monday, let’s treat it like the beginning of a new tradition and give ourselves another reason to break out the Egg Nog and party! We say the more the merrier so let’s all start celebrating each other’s holidays and turn the year in to one long holiday! And that, to quote Cousin Eddie from National Lampoon’s Christmas Vacation, is the gift that keeps on giving. So you’ve planned your Turducken dinner, you’ve purchased your Chanukah presents, and you’ve found the perfect set of bells for your Winter Solstice Bell Ringing Ceremony, now what? Time for email campaigns! Not only is this the best time of year for partying, it’s the best time of the year for email marketing as well. Emails are really like little presents anyways, right? So take advantage of the season by using great holiday email templates to help spread some of that holiday cheer to your clients and customers while continuing to build your own business making this a holiday season to remember. It’s easy and fast. Just follow these tips and tricks to optimize your results. 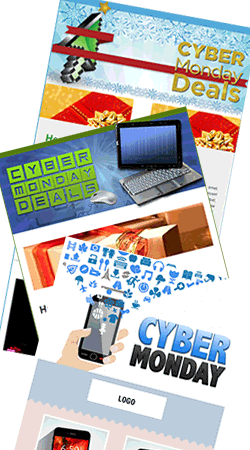 Using creative holiday email templates in your email marketing will ensure your success this season. Send your holiday emails out early. Planning and sending your email campaigns in advance will help you to be the first in line and capture the attention of holiday shoppers. And with ResultsMail’s new Email Campaign Scheduled Sending feature, we make it easier than ever. Just create your email campaign, choose your list to send to and set the time and date you would like it to go out. We’ll make sure it goes out right on time, even if you’re too busy building a Gingerbread House and can’t be bothered to check on it. 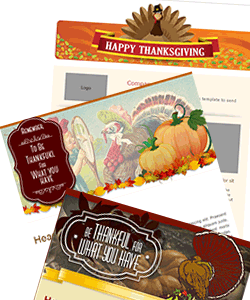 Use one of our specially designed Holiday Email Templates. 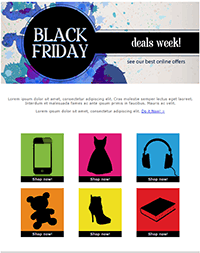 Choose season colors, fonts and images to improve your email layout. They say every snowflake is completely original. Let’s try to make our email campaigns the same…except not as cold I guess. It’s time for email marketers like us to help Santa this season. While consumers are prepping for shopping, we need to be prepping for sales, and getting into the holiday season with plenty of time strategizing and goal-setting now. So in the spirit of holiday giving we’re going to give you a few more tips. Make sure any links are easy to find and click on, and that your landing page and website is quick to load and easy to read. Remember that Black Friday, Small Business Saturday and Cyber Monday are almost here, and you need to be prepared for that. I don’t know about you but we already have our Cyber Monday carols memorized and ready to be sung. You know that Email Marketing is one of the most important communication channels and more and more people rely on the Internet every day. The competition for your clients’ attention gets harder every day, especially in the holiday season. People want to have fun, enjoy time with their family and shop, shop, shop ‘til daddy takes the Amex away; so let’s give our customers a welcome email campaign, with special events, information, sales, coupons, and let them shop so hard their credit cards catch on fire! Use ResultsMail email templates during the holidays, every year we design new holiday email templates that are attractive and easy to use. Our themes are focused on increasing engagement with your audience, so your company can get the best results with little effort. And don’t forget the weekend sales! This is the time of year when your customers want to relax with the family and get the same great deals by clicking “add to cart” while the flickering flames of the fireplace are reflected on their iPad screen. Wasn’t there a Norman Rockwell painting of that? 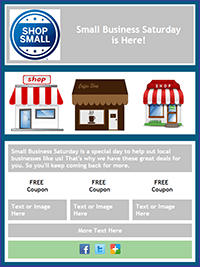 As I’m sure you read in our recent blog post, sending email on Saturday and Sunday will boost your click rates, help you engage more with your customers and increase business. ResultsMail is here to help you stand out from the crowd. You don’t have to keep sending the same old email campaigns. Switch it up. 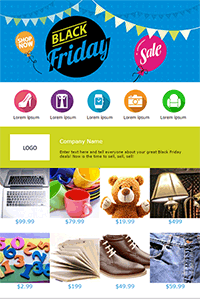 We have no limit to the use of our templates, and our elite design team is hard at work creating new html email templates for you every week, so there is always something new for you to implement. Get creative, personalize your email campaigns and start sending. It’s fun to create when the materials are at your fingertips! With ResultsMail you can create great promotions with exclusive deals that will pique your audience’s interest and have them excited to see more. We want your customers to look forward to your email campaigns. What we don’t want is for your emails to end up in the dreaded junk mail folder (Cue the jail-cell-door-slamming-shut noise). The junk mail folder is like the Hoth of your computer. It’s a cold, bleak, unforgiving planet where your Rebel emails go to hide from the Empire…okay this analogy went a little off the rails. I just thought we’d get more site traffic if I mentioned Star Wars. Okay so back to our tips! Focus on your shoppers and watch what they are looking for on your website and your store. Send coupons and deals and get creative with your offers. November through January is one long party that can leave you hung over from too much profit if you’re doing it right. So get out there and start promoting because the holiday season is approaching faster than Rudolph after hearing that Santa’s been visiting Reindeer breeders online! Oh and here’s a present just for you: an updated holiday calendar to help keep you on track. This entry was posted in Email Marketing Best Practices, Email Templates. « Powerful New Feature for ResultsMail’s Email Marketing Software • Merry Christmas and Happy New Year! These are all great email templates, thank you for adding them! We also added some gift certificate ideas to our holiday emails. This way our clients can purchase a gift certificate for their friends or family in just a couple of clicks.